Welcome to Down On The Street, where we admire old vehicles found parked on the streets of the Island That Rust Forgot: Alameda, California. Alameda has quite a few Rabbit pickups seeing daily-driver service, so let's check one out today. This snazzy-looking truck (I'm guessing it's an '82, but I could be off by a year or two) lives in one of my very favorite DOTS Spots on the island. From one location, it's possible to see this VW, this '66 Mercedes-Benz 200D, this '76 Ford Mustang II, and this '77 Honda Accord. In addition, at least 10 other DOTS cars live within a block of this location. 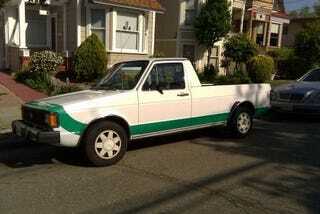 Doesn't it make you yearn for a brand new Volkswagen pickup?